vAzhi ethirAsan – “Hail Sri rAmAnuja!!! 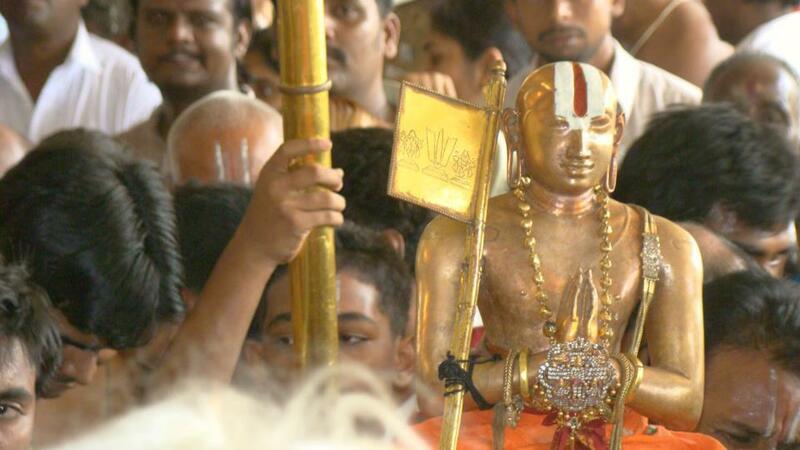 Glories to Sri rAmAnuja!!! Long live Sri rAmAnuja!!! nithyasUris regard certain group of people as their masters. These people are the ones who had surrendered at the feet of those who sing mangalams to those devotees who sing mangalams to those devotees who sing mangalams to SrI rAmAnuja. People who breathe and live by vaidhika (vEdhic) scriptures are known as parama vaidhikas. The nature of these people is to sing mangalams like “pallANdu pallANdu pallAyirathANdu (thirupallANdu 1)” and “poliga poliga poliga (thiruvAimozhi 5.2.1). Typically they do it thrice. maNavALa mAmunigaL begins this work in a similar manner. There are group of devotees (Group A) who sing mangalams to SrI rAmAnuja as in “vAzhi ethirAsan vAzhi ethirAsan vAzhi ethirAsan”. There is another group of people (Group B) who sees these people (Group A) singing glories to SrI rAmAnuja and immediately exclaimed “Long live these devotees who are singing mangalams to the great sri rAmAnua”. Upon seeing this incident, there was yet another group (Group C) who felt happy and started singing mangalams (“vAzhi yena vAththuvAr” vAzhi) to those people (Group B) who sang mangalams to the people (Group A) who sang mangalams to sri rAmAnuja. There were yet another set of people (Group D) who saw and heard the group singing “vAzhi yena vAzththuvAr vAzhi” and surrendered unto them. Their (Group D’s) lotus feet has no parallels in the entire universe and it cannot be compared with anything else. Probably, only their right foot can be compared to their left foot and vice versa. nithyasUris regarded these people (Group D) as their masters and celebrate them. In fact, these group of people (Group D) are in fact much greater than nithyasUris. maNavALa mAmunigaL starts this work with mangalam by using the word “vAzhi”. This entry was posted in Arththi prabandham, Other and tagged arththi prabandham, mamunigal, ramanuja on June 8, 2016 by santhanam rajagopalan. We have just started working on it. It will take some time to complete this series.